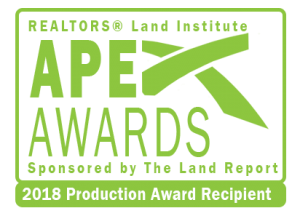 March 19, 2019 (Albuquerque, NM) – David Kle in, Managing Broker with First Mid Ag Services in Bloomington, Illinois, has been recognized as an APEX 2018 Top 20 National Producer by the Realtors® Land Institute as a part of the RLI APEX Production Awards Program, sponsored by The Land Report. David was recognized by RLI CEO Aubrie Kobernus, MBA, RCE, as well as The Land Report’s Co-founders Eddie Lee Rider Jr. and Eric O’Keefe at a special awards ceremony on Tuesday, March 5, during RLI’s 2019 National Land Conference (NLC19) in Albuquerque, New Mexico. “I feel very fortunate to be a part of our team serving clients on numerous farmland transactions in 2018. Our entire staff of professional farm managers, real estate brokers and assistants totaled over $95 million in sales last year, representing 10,246 acres in 23 different counties across the state of Illinois. These awards are greatly appreciated, and are a reflection of the efforts of our team,” said Klein upon receiving the award. “We are proud of David and all of our members that were recognized as part of our award programs for their accomplishments in 2018. They truly are the crème of the crop when it comes to land real estate professionals,” said Aubrie about the winners. The APEX Awards Program celebrated its second year by doubling in size with 100 applicants totaling a combined $2.3+ billion in qualifying transaction volume. All land professionals recognized as part of the RLI APEX Awards Program are active members of RLI. The 2018 APEX Top 20 Award winners were ranked within the top 20 applicants by qualifying production volume, starting at around $36.5M in production volume. For more information on the award winners, make sure to get a copy of The Land Report, one of the industry’s leading magazines for landowners and land professionals, which will be publicizing the top winners in their upcoming Spring 2019 issue. Learn more at rliland.com. First Mid Ag Services, a Division of First Mid Wealth Management Company is chartered in the State of Illinois and offers a wide range of financial products and personal services to its clientele. The company is licensed as a Corporate Real Estate Broker (License #078‑0010890) and sells farmland throughout the state of Illinois. Over 300 successful auctions have been completed since being licensed in the fall of 1990. Additionally, a number of farms have been sold by private treaty. Farms have been sold in 43 Illinois counties totaling more than 153,000 acres for over $1 Billion. David Klein, AFM, ALC, serves as the managing real estate broker for First Mid and focuses on selling farmland by private treaty and public auction throughout the state. 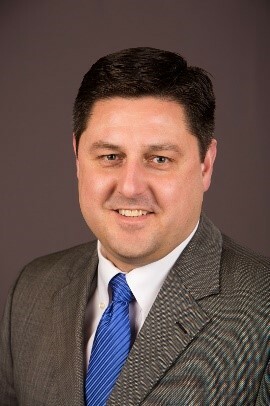 He leads 35 licensed real estate brokers located in six Central Illinois offices specializing in farmland sales.